About a year ago, I found Heather Bailey while searching online for a fun gift for a friend who was into sewing. The colors on her site are amazing (she makes a fabric line), and she has some fun patterns - even free ones! I printed out the pincushion pattern and put it in a cute sewing basket with some pretty fat quarters for my friend. But the important part of this story is that I also found a pattern for precious little baby booties. And they stuck on my brain. 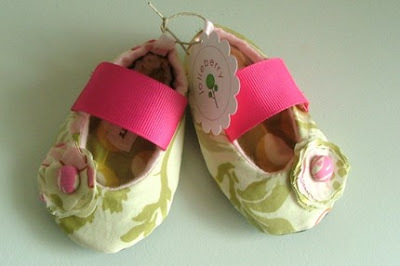 Logan was too big for them, but the same friend I gave the sewing gift was expecting girl #2. Should I attempt? I hadn't really used my sewing machine for more than throw pillows and scrapbooking, so I gave up and found some precious ones on etsy (where there were MANY to choose from). I bought these super cute ones from JolieBerry. Adorable, huh? Now that I'm a more skilled sewer (is that a word? Or should I say seamstress?) I've seen other tutorials on the blogs I follow. Now I just need a friend to have a baby so I can give it a try. Preferably a girl, because they can get away with much cuter shoes. Any volunteers?